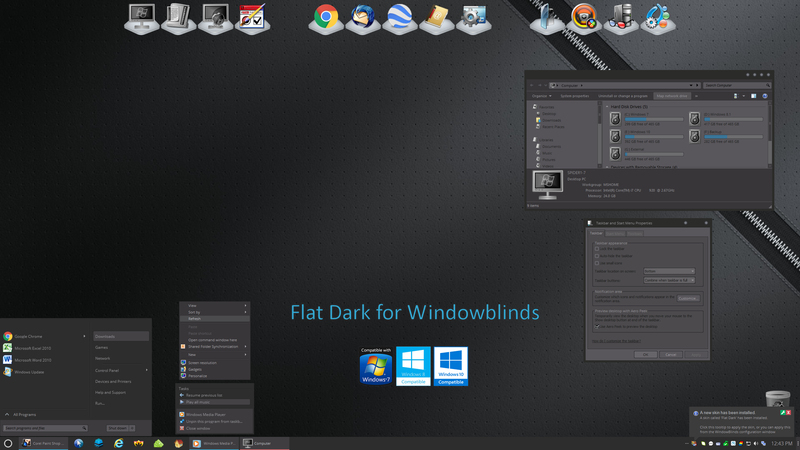 Flat Dark is another new, somewhat modern looking free skin for Windows 7, 8 and 10 with great usability. A roll-up button has been integrated into the skin for those who use it, and the desktop wallpaper shown is included with your purchase. I received a request to make this skin quite awhile ago from a site user, but he is not communicating back with me on it, so I decided to release it free to the public. Many thanks to RedneckDude for his assistance in the testing of this skin, and thanks to everyone for your continued support of my work! For those of you who like modern looking skins, Flat Dark is definitely for you! I quite. I have one just finished yeaterday and going to upload tomorrow. Almost like this one so in the trash it goes. Dave, please don't do that, upload the skin! I agree too. Please upload your WB. I'll give you a lollipop. I agree with everyone else Dave. Thanks Tom this is the type of skin I was hoping for, I love it. Thanks much AlMonty, glad you like it. Thanks Tommy! Good job for flat. Tom, this is an awesome skin! In SkinStudio 10 Abku, go to Change Skin Colours, and in the dropdown box select Show me the skin defined system colours. Using the bottom scrollbar scroll to the far right and change the Explorer background (Win 10) and the Explorer folder bar background (Win 10) colors to white (255, 255, 255). That should do what you want. I would recommend reloading the original skin before doing the above. Thanks for the nice comments everybody! In SkinStudio 10 Abku, go to Change Skin Colours, and in the dropdown box select Show me the skin defined system colours. Using the bottom scrollbar scroll to the far right and change the Explorer background (Win 10) and the Explorer folder bar background (Win 10) colors to white (255, 255, 255). That should do what you want. I would recommend reloading the original skin before doing the above. I got till Skin defined system colors but I do not see Explorer Background (win 10). Maybe the version of skin studio I am using? I am on version 10. Are you using SkinStudio 10.1 AbKu? If not, you need to install it. Thanks Jake. I know you can't change the skin yourself, so just PM me with your email address and I will send you a modified skin. AbKu, if you cannot change the skin yourself, please do the sameand PM me with a current email address. I quite. I have one just finished yeaterday and going to upload tomorrow. Almost like this one so in the trash it goes. nice skin. Please don't quit on the skin. I would love to see it. Thanks LightStar! Love the skin. Thanks Jake. I know you can't change the skin yourself, so just PM me with your email address and I will send you a modified skin. AbKu, if you cannot change the skin yourself, please do the sameand PM me with a current email address. Thanks for the offer Tom! I am not sure where to download the updated SkinStudio. I just edited the file in notepad and fixed the color. That did it! Thanks again Tom for this awesome skin! NotePad works too if you know what to look for AbKu, glad you got it to your liking! Oh, and you should be able to download the latest SkinStudio from your Stardock store account, same place you download Windowblinds.